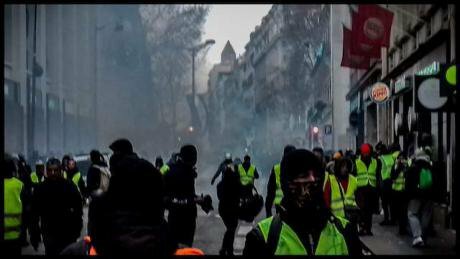 The Gilets Jaunes have arisen out of the profound inequality that is fracturing societies across Europe. It is against that inequality that leaders must take a strongman stance. At one of the weekly ‘act’ protests in Paris not far from La Place Sainte Madeline plain clothes police ended up behind a wall of Gilets Jaunes. As they tried to move away they ran into the back of Wilfried, a steelworker from a small town in Burgundy who has recently had a child with his wife of nine years. The policeman fell over at his feet and Wilfried, moving to try and escape the ensuing chaos, spooked a policeman whose hair-trigger instincts led him to shoot Wilfried in the face with a flashball at a range of just over a metre. Flashballs used primarily in France are rubber bullets that are fired from weapons with the stopping power of a .38 calibre pistol. They can do real damage (as you can see here). There is an unverified recent rumour that someone shot by one lost an eye. Wilfried now sports a nasty scar on his forehead and experiences some symptoms of psychological trauma. He continues to protest, but he is more cautious. Axelle suffered 2 fractures to her jaw and was left with second degree burns when she was shot in the face by a flashball. She was left looking like someone had bunched a whole pack of cigarettes, lit them all, then stubbed them out on her cheek. The shot to the face caused a trismus (an involuntary contraction of her muscles) meaning she could barely open her mouth. She is a waitress while she looks for a job and has become very vocal in the campaign against police brutality since the incident. She says she was traumatised by the incident: at the time she was convinced her cheek had burst. Etienne, a railway worker was badly injured on the same day that Wilfried was shot in the head. After hours of being teargassed in Paris he found himself caught between the CRS and the procession he was trying to join. He was there for 10 minutes as tear gas canisters went off, without any major incident. But then, suddenly he collapsed. He was carried away and given first aid. A subsequent hospital visit revealed that the flashball that hit him had shattered his shin bone. He has to take 90 days off work because of his injury and has had to cancel a holiday with his girlfriend too. He can’t drive, so he can’t go and see his two daughters who live with their mum. He has been made more rebellious by the incident. He wants to carry on fighting the cause for justice. He’s a committed anti-capitalist, but he acknowledges there are issues with the movement. He says he wants to see the end of capitalism and the renewal of humanity. Like Wilfried and many others, the repression has only reaffirmed his commitment to the movement. Teargas in Paris.Manon was on the climate march on the 8th, then stayed around for the Gilets Jaunes. Her and two friends were walking away from the city-centre at the time. The only indication she had been protesting was that she wore her nurse’s coat and was carrying a first aid kit. When she was shot, the protest was over and there was no crowd. She’s not even entirely sure where it came from, only that it hit her in the foot. Such is the nature of the flashball that the possibly accidental shot fractured her metatarsal. She has filed a complaint, and has been forced to go on sick leave until early February. Flashballs are not the only weapons the CRS use to maim protesting citizens. Siegried was a protestor on the roundabouts but decided to go to Paris where the more impactful protests were. He made the journey back from Paris to Vitry le Francois via Reims where he was treated for severe injuries. Hundreds of tiny bits of plastic had peppered his skin and perforated his ear drum. He had stood too close to a CRS tactical grenade when it went off. Other people have been battered by truncheons and water cannons. These were a handful of cases from Paris, but there are many more wounded by the brutal apparatus of the security state trying to crush their protests across the country. Jacques Pezet is a factchecking journalist for Liberation and found 94 cases of severely injured Gilets Jaunes by January 14. His count was only those that could be verified with complete certainty. The campaign group Desarmons-les and the journalist and documentary maker David Dufresne have counted more. Many people have made claims about the Gilets Jaunes and fake news – antisemitism and conspiracy theories have been a problem within the movement. This was how Jacques started looking into it: people kept coming to Checknews, the department of Liberation that he works for, to see if the claims being made online were true. He tells me that out of the compilations of injured Gilets Jaunes that have been circulated, he thinks at least 8/10 are real: the others are lacking in detail or are of poor photo quality making them difficult to verify. In the beginning there may have been some fakery surrounding images online, he says, but now there are so many people injured, particularly people shot in the face by flashballs, that the people who wanted to fake things to make a point have become redundant, their point has been made for them by the facts. He told me about David Dufresne’s thesis that the high level of violence is due to inexperienced police officers being drafted in who normally deal with hardened criminals like drug dealers, and who consequently do not know how to respond to ordinary people. This is no excuse though for the state maiming its citizens: use of flashballs is both unnecessary and shocking. Given the number of severe head and facial injuries, you would never have guessed that the police are not supposed to shoot people in the face with flashballs. But they seem to feel that they can act with impunity. Currently the number of inquiries into violence by police stands at around 60 and will increase as time goes on. 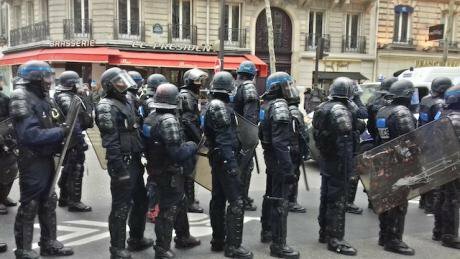 The campaign to disarm the riot cops is gaining traction in a way not seen before, because even seasoned French protestors are alarmed by the reaction they have been met with. Many figures of the European establishment regard Emmanuel Macron as the saviour of the European project. Yet his response to these protests – violence, mass arrests and the reinstatement of national service for 16-year olds – would hardly be out of step with the more retrograde national populist and authoritarian regimes. If Emmanuel Macron wants to save his reputation, let alone Europe, he must start leading by example, ban the flashball, and take these protests seriously rather than continuing to lapse in moments of anger into diatribes about scroungers while he lets the riot cops run riot against protesters. Macron’s response suggests what other leaderless protest movements across Europe will face as systems continue to collapse. The Gilets Jaunes have arisen out of the profound inequality that is fracturing societies across Europe. It is against that inequality that leaders must take a strongman stance. There is nothing strong about attacking protestors who are just trying to make their voices heard.